Save for a promising 6-4 start in 2012, Greg Schiano's tenure in Tampa was a mess and a real disappointment. Schiano came to the organization with the reputation of a strong college coach who built up the program at Rutgers, but he leaves after his strict style rubbed many the wrong way and the reputation of being just about a control-freak. That style works in college but it didn't work in the pros when you are coaching players that almost all make more money than he does, instead of student-athletes on scholarship. So that's why it makes sense for the Bucs to hire the anti-Greg Schiano in Smith. 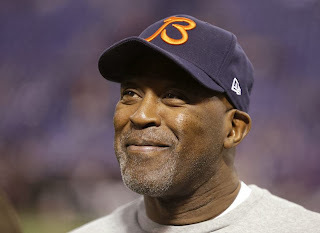 Smith is a coach from the Tony Dungy tree in that he commands respect from his players without having to lose his temper and instead remaining calm even during difficult patches. He is a players' coach but not too much of one that he can't lay down discipline when needed. And for that alone, he should be received very warmly by the Buccaneer players. Also, while some in Chicago may disagree, Smith was very successful with the Bears even as he only made the playoffs three times in nine years. Those playoff appearances were all division titles and one cannot forget that he led a team with Rex Grossman as its quarterback to the Super Bowl. Also, let's not forget how mediocre the Bears largely were in the decade plus since Mike Ditka was fired after the 1992 season. It also does not hurt that Smith is an excellent defensive coach that should mess well with a talented yet underachieving defense that features an All-Pro caliber player at each level of the defense and yet did not finish in the top half of defenses in the league statistically. We saw what the Bears looked like this year defensively after Smith was gone, they took a major step backwards. It also does not hurt that Smith has experience working with the team during their glory days with their vaunted defenses under Dungy as he was the linebackers coach for the Bucs from 1996-2000. What will be key for Smith in Tampa Bay will be the offense as it was generally an issue in Chicago. He will be bringing in former Cal coach Jeff Tedford as his offensive coordinator and while Tedford was known for working with quarterbacks and designing unique offenses in his days in Berkeley as well as when he was the coordinator at Oregon before that, he has no NFL experience. There is talent offensively for the Buccaneers with Doug Martin at running back, Vincent Jackson at receiver, some solid offensive lineman and Mike Glennon, who was a surprise as a rookie under center. Smith made perfect sense for Tampa when they axed Schiano and I think the organization made a great move and will surely benefit as a result.